If I told you where I lived, how quickly would you run me off of this website with pitchforks and shovels if I picked all seven teams in this division to finish T-1 and tried to justify it? Less chaos than usual, actually. So let’s take it further back. 2012: UNC wins by tiebreaker, at 5-3, over Miami and Georgia Tech. UNC is postseason-ineligible. Miami, instead of playing in Carolina’s stead, also rules itself ineligible. So a 6-6 Tech team goes, loses, and gets a special waiver to play a bowl game with a losing record. There, they beat preseason #1 USC in the Sun Bowl. 2013: Duke closes the regular season with eight straight victories and wins the division. This still baffles me. Okay, so back to last year. By the middle of October, this had already happened. 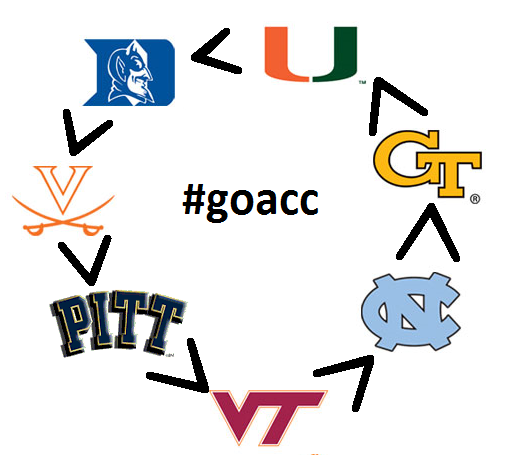 Once the universe failed to collapse into itself (and it’s the ACC, we were good anyway), Tech got really hot. Like, it still doesn’t make sense. But when your high school offense has a 4.4 quarterback who stays healthy AND can kinda throw the ball? Hey. I’ll spare you seven T-1’s. Maybe. The only logical pick to finish last: because they have done so each of the past five years. (7) Virginia. Look, they have a lot of talent. But Mike London simply can’t coach his way out a wet paper bag, and the AD is doing him NO favors by keeping him on this year. Their September schedule reads as follows: at UCLA, Notre Dame, William (and Mary! ), Boise State. Even if they were well-coached and as talented as I say, the collective morale would be shot while baseball is still playing its regular season. David Cutcliffe DA GAWD: if I’m wrong about (6) Duke this year, I give up. Cutcliffe got sacked at Ole Miss for one mediocre season post-Eli Manning, and has made Duke a viable football program. They suffered extreme personnel losses (and, sadly, lost All-ACC linebacker Kelby Brown to his FOURTH ACL tear last week). Frankly, I’m sleeping on them, but like I said: you’re not reading. After that, it’s so freakin’ murky: I’ll make a pick when I sum up all of these previews into one big one, but first I need one of these five to sign Braxton Miller, hire Vince Lombardi, or (more likely) receive crippling sanctions. S**t, North Carolina is the only one with pending NCAA issues. No crippling sanctions, please. Given the guesswork involved, I’ll tell you why each is a viable candidate to win the division at 9-3…or be 6-6. If you’re feeling lucky, I’ll bet you a dollar that EVERY one of these teams falls between those two numbers. Tweet me to apply. 9-3: Justin Thomas develops rapport with his new backs and receivers, the defense improves on its Johnson-era worst 411 yards per game. 6-6: Well hell, they did it last year with the second-best draft class in all of college football! 9-3: Gene Chizik revitalizes his rep as a STUD defensive coordinator, and the 10 returning starters on offense put up 40 points per game. 6-6: If Chizik does NOT fix the D, 40 points per game will land the Heels right at 6-6. 9-3: Pat Narduzzi’s defensive magic works in year 1 as the head man. James Connor keeps bulldozing people at 6-2 250 while running a 4.5. The massive OL and Chad Voytik take another step forward. If all of this happens, Pitt could honestly go undefeated. 6-6: Including bowl game interim coaches, Pitt has had SEVEN in the past six seasons. Or, if you will allow, in the past 54 games. Point being, they can’t have nice things. As such, Connor, Tyler Boyd, and the D all flop. 9-3: Can we all remember that they beat Ohio State last year? Channel that, maybe. And do it again, while you’re at it. Add the genuine return of BeamerBall. Plus a competent O. Damn, this ain’t happening, even if their secondary is the best in the country. 6-6: Honestly the more likely of two outcomes. The offense failed to score a solitary point in 60 minutes of regulation vs. Wake Forest. In the past six years, they’ve exceeded 400 yards per game one time. And walking through that door at QB? Michael Vick Marcus Vick Bryan Randall Tyrod Thomas Logan Thomas lol I just used Logan Thomas as an improvement over MICHAEL BREWER! 1. Ohio State at Virginia Tech, Sept. 7: My hatred for Virginia Tech borders on irrational, so this is going to be FUN. And it’s on a Monday. To steal a term usually associated with Les Miles, CFI. Google it. 2. Miami at Florida State, Oct. 10: What if I told you a struggling coach coming off of consecutive losses to Nebraska and Cincinnati got two extra days to prepare for his archrival, and punched his way off the ropes? 30 for 30: The U, Part 3. 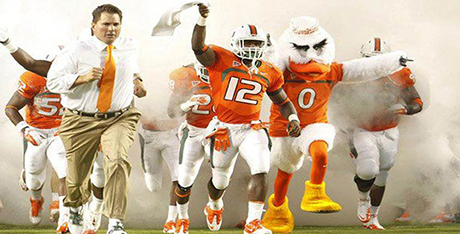 Memegenerator, for some reason, would not make Al Golden images into memes. I’ve failed you. 3. North Carolina at Georgia Tech, Oct. 3: Let me explain. Since 2005, this game has foretold the result of the Georgia/Tech game. Tech has gone 1-1 against Carolina and Georgia every year SINCE 2004! If Carolina wins, Georgia loses, and vice versa (hence why it’s nice to have Georgia to dry my tears as one who grew up on UNC football.) Dawg fans, you may have to pull for the nerds here. I won’t. 4. Pitt at Virginia Tech, Oct. 3: Why the term rockfight exists. 5. Virginia and Miami vs. anybody, all season: Hotseat desperation drives a man to do crazy things. And Mike London/Al Golden are the leaders of #PinkelWatch 2015. Hell, Golden may wear a dress shirt that doesn’t belong to Rick Ross. No meme, no problem. Apparently. – Dadi Nicolas, DE, VT: First off, his name is Dadi, pronounced “daddy”. Secondly, this. Third, he led God’s green creation in QB hurries with 35 last year. – Kendall Fuller, CB, VT: Lockdown cornerbackin’ NFL Blitz-style. – Brad Kaaya, QB, Miami: Apparently the answer to the question, “but what if Miami had a QB?” He’s got that Christian Hackenberg sophomore slump scent on him. – Justin Thomas, QB, GT: Yeah. – Jamal Golden, S, GT: Perfect name for the school colors? Special teams and big play dynamo? Yeah, he’s ripe for a lame Brent Musberger pun at some point. – Tyler Boyd, WR, Pitt: Pretty much Amari Cooper except he plays games against Iowa at noon on ESPNU. – James Conner, RB, Pitt: Prediction #2 of this piece: Conner makes the neck roll cool again in the NFL. – Ryan Switzer, WR/PR, UNC: Set the nation on fire with 5 punt return touchdowns as a freshman. Sucked as a punt returner as a sophomore, but improved as a wideout. Maybe this year he could, you know, do both? – Shaun Wilson, RB, Duke: Not even listed as the starter, but he gets buckets. 7.7 yards per carry, 6 TD on 96 touches, and blinding speed. – Quin Blanding, S, Virginia: He’ll be the next “ha, I didn’t know Virginia played football!” guy taken in the 1st round of the NFL Draft. As a true freshman, he had 123 tackles and 6 passes broken up. And he’s a 6’4 safety, so LEGGO Sean Taylor comps. Well, bye. SEC week next week! Posted on July 10, 2015, in Blog. Bookmark the permalink. Leave a comment.